So The FBI is at Your Door. . This is a repost from about three years ago. It’s important to note that this the only version to still exists online. Apparently the FBI has sent privacy complaints to youtube regarding their identities being open to the public. If you are an agent with the FBI and take issue with this post, consider how it would feel to be a law abiding person and be visited by agents for “pre crimes”. And if you take issue with this video being online, please contact the ACLU Northern Branch. . . .
On April 21, 2010, two agents of the FBI’s Joint Terrorism Task Force (JTTF) came to my house to talk to me, a part time peace volunteer for Palestine. After verifying that they really were with the FBI, I asked them to wait. I shut my door, took a deep breath, and grabbed my video camera. In an ideal world what prevails is “the truth.” Therefore, if you are innocent, you have nothing to fear since ultimately you will be found innocent. But the real world is not ideal; and what really counts in this world of ours is the “perception of truth.” Powerful governmental institutions with insurmountable resources at their disposal in terms of skills, money, manpower, organization, computer systems, etc. can create a perception of truth that ends you up in prison—even though you are innocent. This is why there are innocent people on Death Row. Consequently, the only prudent answer, when interrogated by government officials, is to exercise your Right to Remain Silent, and request an attorney, specially, during the current times of political agitation and war hysteria. I want to thank Jeffry Zavala for: * Helping me remain anonymous in this video * For creating something to help you if the FBI ever knocks on your door to question you about pre-crimes,* For helping me to tell others about my number one cause: Promoting the “One-State” Solution to the Palestine-Israel conflict, instead of the apartheid-like “Two-State” scenario. 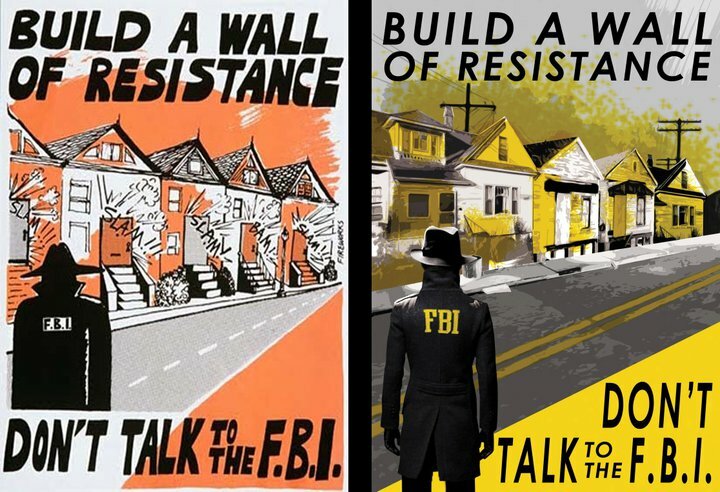 Click here for more about your rights when the FBI comes to your door. . . Comments Off on So The FBI is at Your Door. .